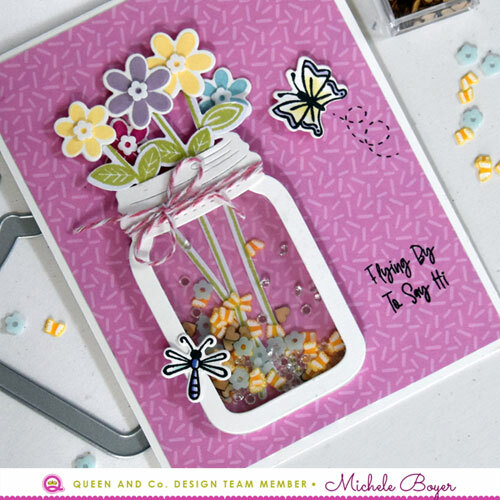 Category Archives: Queen & Co.
My first card uses both Love Jar and Bug Jar kits, new Love Jar Flower & Stem dies and a sprinkling of new Wood Toppings. I was so very excited to see the Love Jar dies, and those wood toppings….adorable! There are six shapes, each packaged in new mini topping bottles. I used a block of Birthday Bash patterned paper as my background. After stamping and die-cutting the flowers, I positioned each on the patterned paper, using the jar die as a guide. The bottom half of each stem was glued in place then the jar foam shape was adhered. I filled with Love Jar toppings, Bug Jar toppings, a few clear Diamonds and Wood Heart shapes. Before adhering the jar top, I nipped off the flower stems at the top of the jar, adhered the jar lid, then inserted each stem through the jar lid opening, tucking the top edges back under the flowers. Each end was secured using Sheer Glue. Each flower at the end of a stem was adhered using a foam square (cut from the negative space leftover from within the foam jar shape). Once the jar was assembled, I stamped, colored and die-cut a dragonfly and butterfly then attached each to the jar and patterned paper. I applied glue only to the body portion so that I could bend up the wings slightly. I tied a bit of string then stamped the sentiment. Next, I stamped the lightning bug from Bug Jar stamp set in a block pattern and colored the bodies with bright Copic markers. Once colored, I adhered the panel to a block of Fruit Basket patterned paper, then adhered to a card base. I’ve been having a blast with the Bug Jar kit, and I love that it corresponds so nicely with the Love Jar. Hi everyone! 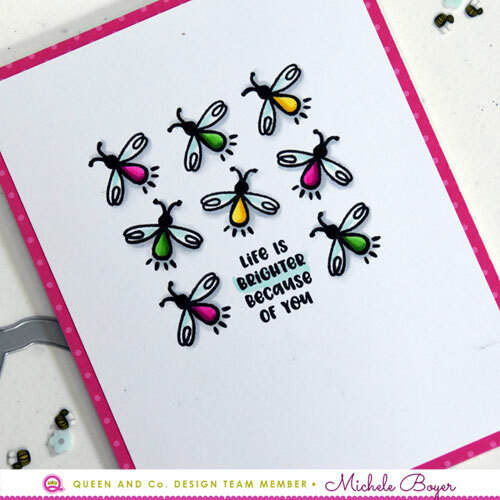 Today I’m sharing two cards I created with Queen & Company’s adorable new Bug Jar kit. 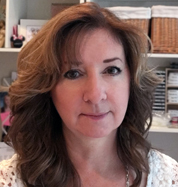 The kit ingredients work well on their own, or perfectly with my favorite, Love Jar kit. 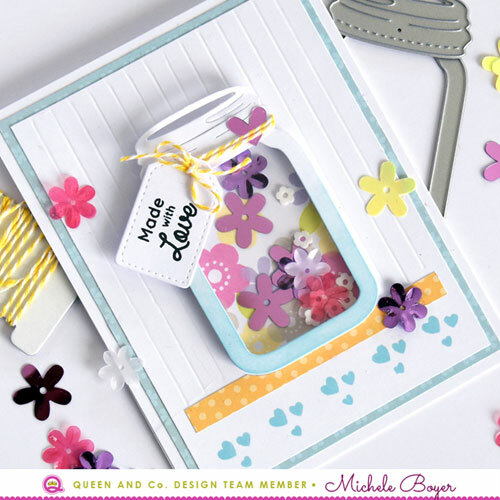 The Bug Jar kit includes 30 stamps, 16 dies and 11 collections of the cutest little bug toppings! 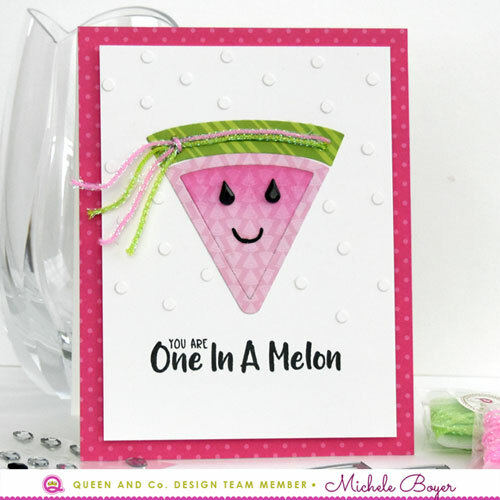 To create my first card, I used the jar and lid die from the Love Jar kit, with patterned papers from Birthday Bash paper pad. Inside the jar, I placed cute tiny bee toppings along with some blue flowers from the Love Jar kit. 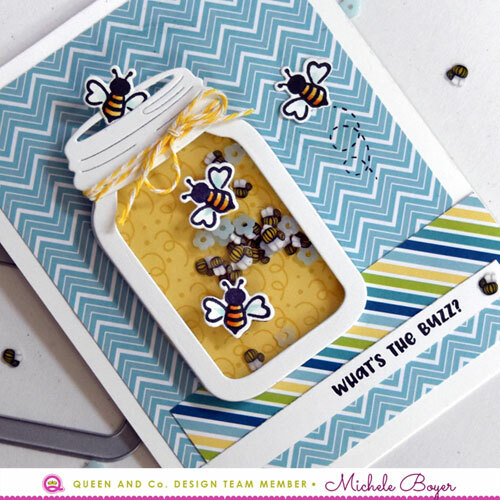 I stamped, colored and die-cut several bees, attaching two to the shaker window using Sheer Glue. The glue was placed behind the body portion only so the wings were free to bend forward just a bit. I adhered a third bee over a stamped dotted trail and tucked the last one just inside the jar lid. He’s looking for a quick escape. 🙂 Lastly, I tied a bit of yellow twine (from the Love Jar kit) around the jar lid. 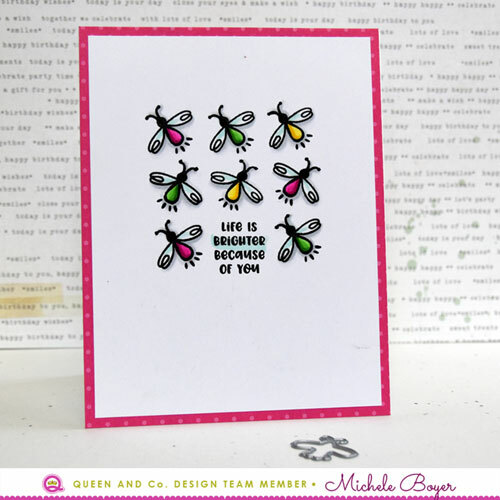 I kept my second card very simple, using only stamps and dies from the Bug Jar kit. After stamping the branch and leaves, I added a bit of shadow using light gray markers to create dimension. The caterpillar was stamped, colored then die-cut and adhered above the branch. 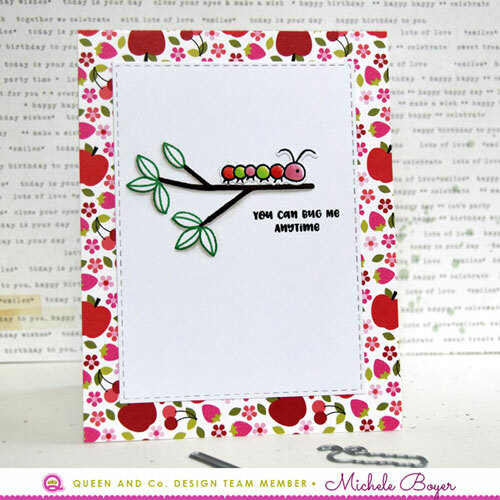 I stamped the cute sentiment beneath the branch then adhered the completed panel over Fruit Basket patterned paper. In addition to the Bug Jar Kit, a collection of refill Bug Jar Toppings are available. I see the Bug Jar kit quickly becoming one of my favorites. I adore the sentiments and bugs! 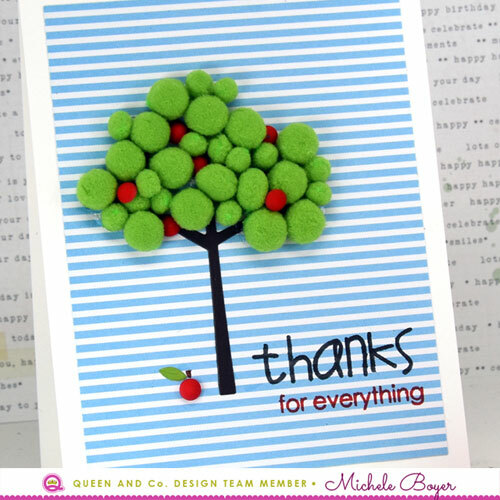 First, I created a thank you, perfect for a teacher, tutor or anyone, really. I used a tree die to create the tree base, then adhered to light blue Simple Stripes patterned paper. Then, using Sheer Glue, I randomly adhered small and large green pompoms. Between the green pompoms, I tucked several red Rubber Bubbles to resemble apples. I added a single red Rubber Bubble at the tree base, drew a tiny stem and added a small die-cut leaf. Next I created a super simple card with pompom “lemons.” I pinched the ends of six yellow pompoms then adhered each with a small Gloober. I drew in tiny stems then added die-cut leaves. Once the sentiment (from Paper Smooches) was stamped, I adhered the panel to a block of green Delight Dots patterned paper. The assembled panel was then adhered to a white card base. Q&C pompoms are available as part of the Birthday Bash kit as well as a kit refill and cute individual drawstring bags. On my first card, I used multiple pompoms to create flowers in the shape of a heart on yellow Delightful Dots patterned paper. I found it helpful to layout the design first then snap a quick photo with my cell phone to use as a reference when adhering the poms. To create the small green leaves, I trimmed just a tiny bit away from one side of a small green pom then pinched the ends before adhering. To adhere each pom, I used medium and small Gloobers. Using the Gloobers, assembly was quick and easy with no mess. Once assembled, I added a die-cut sentiment then adhered the panel to my card base. 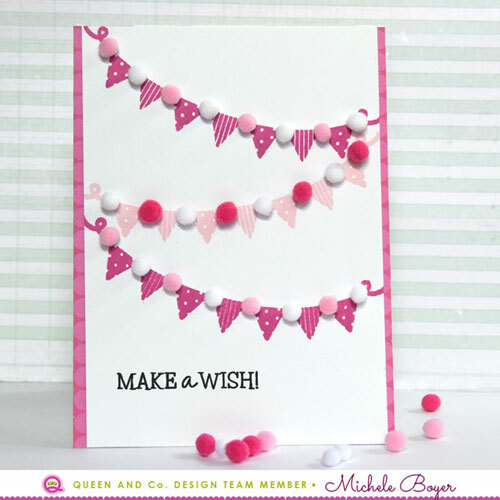 Next, I created a Welcome Baby card, using pompoms as a sort of mobile. 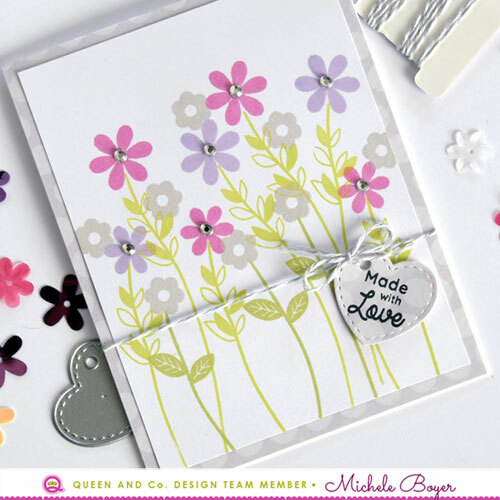 I first adhered a block of Flirty Florals pattered paper to a white card base. I then die-cut white card stock using the long side of an oval die. I die-cut a second piece of white card stock, again with the oval die, then slid the die down just a bit and die-cut again to create the arched border. I adhered a strip of foam tape behind the “canopy,” then adhered lengths of white string to the foam tape. I adhered the canopy to the top of the floral paper with the strings loosely hanging down. I determined the length of each string then adhered Gloobers to hold the string ends in place. I trimmed away the excess string then adhered my poms. To create the white “paneling” below the mobile, I firmly scored white card stock every ¼”, added a thin strip across the top and, lastly, adhered the die-cut sentiment. 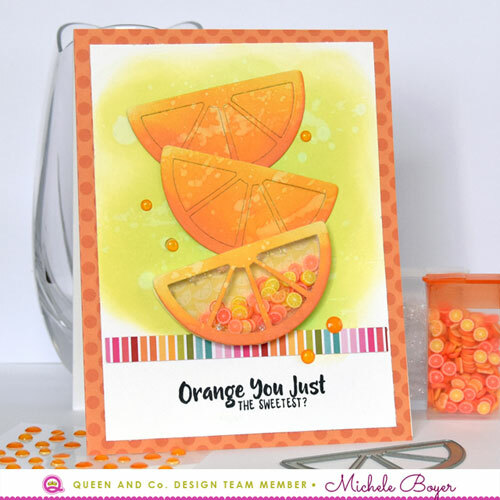 The Birthday Bash kit can be used for so much more than just birthdays! How else can you imagine using the pompoms? Thank so much for visiting today! Using the Rainbow Foam Front Shaker kit as inspiration, I created a Ric Rac rainbow using pink, green, blue and purple. 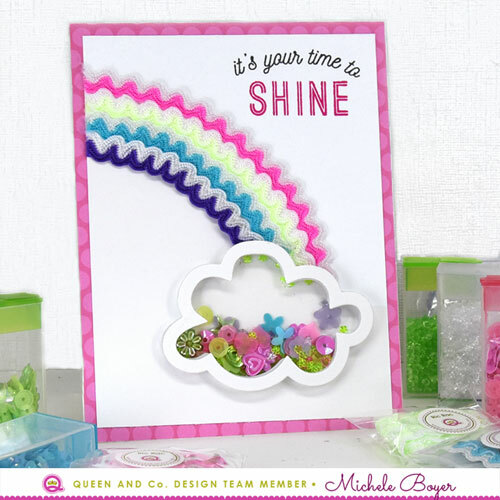 At the end of the rainbow is a cloud shaker from Spring Shaped Shaker Kit. I adhered the ric rac with super sticky double-sided tape, trimmed the left edges and marked the cloud ends lightly with a pencil, using the cloud shape as a guide. I trimmed the ends with sharp scissors then adhered the cloud foam shape. After filling the cloud with Sequins and Jewels, I stamped a Spring clear stamp sentiment in the corner. Once assembled, I adhered the completed panel to bright pink dotted paper from new Birthday Bash paper pad. Next, I created a pattern of small flower buds using new Purple Halos and tiny die-cut leaves. The new Halos are available in seven colors, all super-sparkly. I adhered three rows of three then added tiny die-cut leaves (from Paper Smooches Flowers 2), cut from Picture Perfect patterned paper. Once the Halos and leaves were assembled, I adhered the panel to a block of purple Delight Dots patterned paper then again onto a white card base. 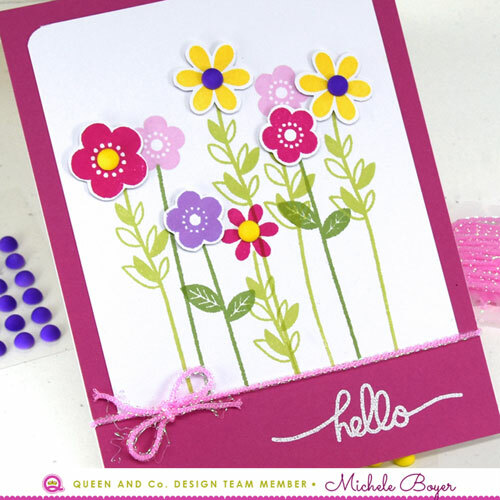 To finish my card, I added a die-cut hello sentiment (from Simon Says Stamp Handlettered Greetings). Hi everyone! 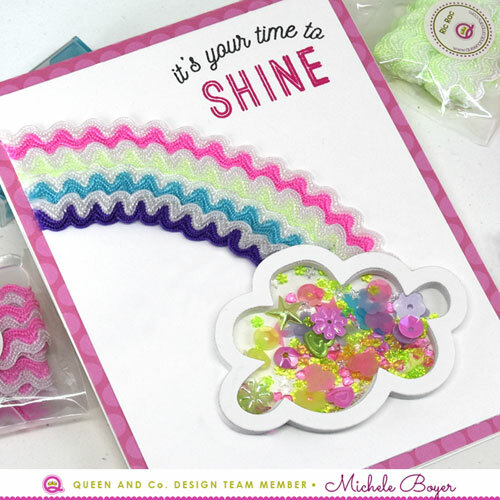 I’m sure by now you’ve seen Queen & Company’s new Birthday Bash kit. If you haven’t, you definitely need to check it out! 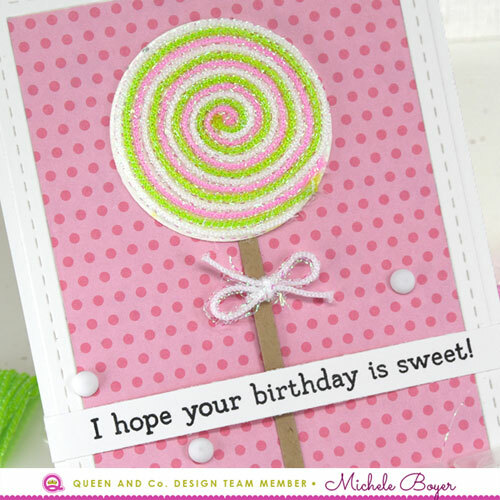 It’s SO much fun and SO easy to create quick birthday and congrats cards. The kit includes pompoms galore, three different sizes in seven different colors each! 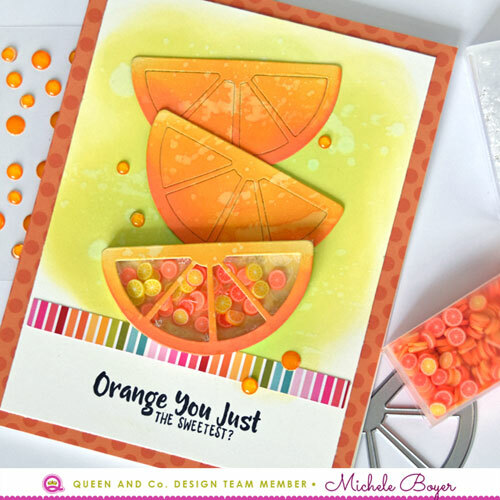 There are stamps with coordinating dies, candle flame bling and a Birthday Bash 6×6 paper pad. 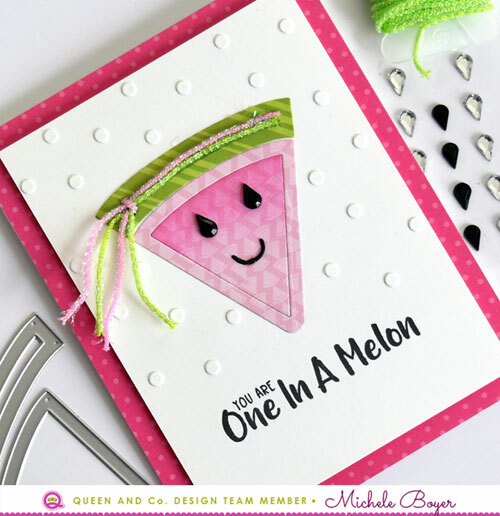 On my first card, I stamped the banner in two different pinks then alternated pompom colors of light pink, dark pink and white in between the flags. New Gloobers make adhering the pompoms very quick, easy and mess-free (my favorite part). They are super-sticky double-sided adhesive dots, available in three different sizes. They are included in the kit as well! Simply adhere a Gloober and press the pompom in place! 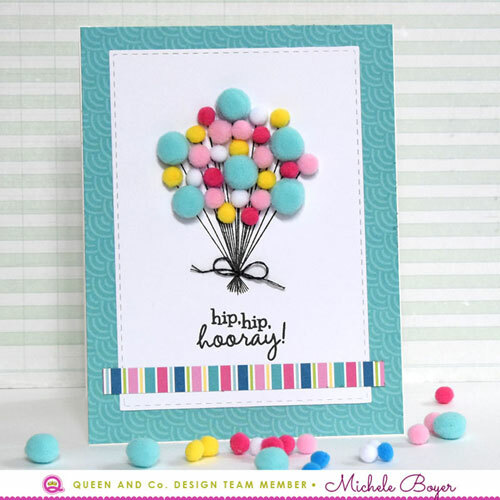 Next, I used the balloon bouquet stamp and pompoms in a variety of sizes and colors. Perfect for male, female, any age! 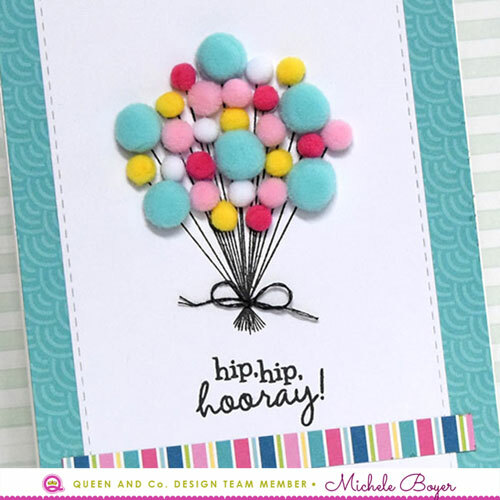 I love that the Birthday Bash paper pad includes colors and patterns, all fun and perfectly suited for everyone. Before adhering the finished panel to my card base, I tied a bit of black string around the stamped strings. 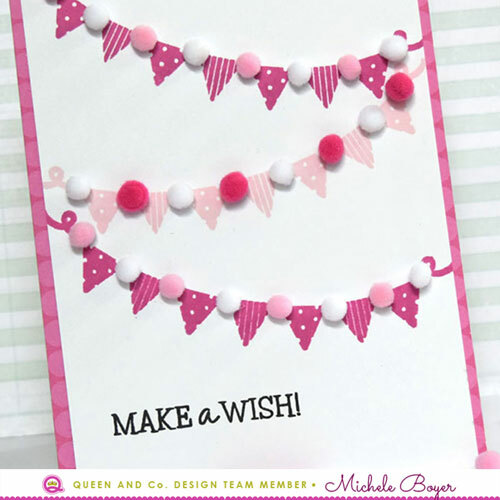 You can grab your Birthday Bash kit HERE, an extra Birthday Bash paper pad HERE, refill pompoms HERE, extra Gloobers HERE and additional candle flame bling (otherwise known as Twinkle Drops) HERE. First I used new Layered Flowers. There are four each of three different styles, eight colors, all shimmery with rhinestone centers. I adhered each of the flowers using new Gloobers. Available in three sizes, they are super-sticky double-sided adhesive dots, perfect for adhering embellishments such as flowers, pompoms, anything really, but especially embellishments that might otherwise be a little tricky to adhere. I used green Sparkle String to create stems and leaves, securing the ends on the back with tape. Along the top and bottom, I adhered thin strips of green Simple Stripes patterned paper then added a simple, white embossed sentiment. I adhered each of the flowers with a medium Gloober, tucking a simple die-cut leaf behind a few before securing. The stripes on the sides are also from Simple Stripes patterned paper, one of my all-time favorite “go-to” paper pads. Which are your favorites of the new flowers? Let me know below! Hello everyone! It’s been so very cold and dreary lately, I decided to pull out some fun bright papers and dies. Queen & Company’s Fruit Basket was the perfect fit! 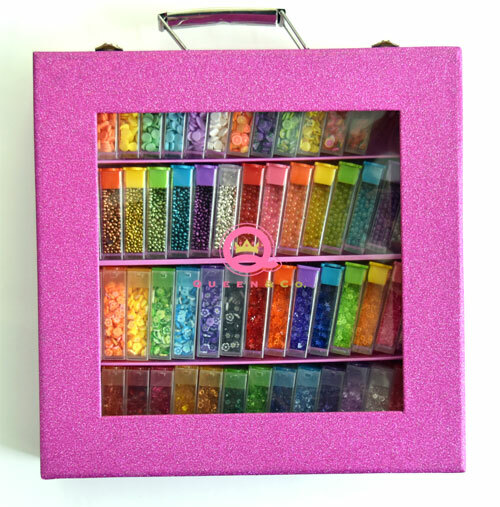 Before I get to my next card, I wanted to share how I store those super cute topping containers. Queen & Company’s new Topping Trunk INCLUDES 62 containers of the most popular toppings! I absolutely love it. It’s so nice to have them contained, all in one pretty sparkly pink place. 🙂 You can find a list of the toppings included HERE. First I created a shaker filled with both stamped flowers and sequins. With some flowers stamped inside, the jar appears more full, even if the sequins are pooled at the bottom. After determining the jar placement, I masked off that section with removable tape then stamped random flowers within. I adhered the foam shape, added a sprinkling of sequins and white flower toppings then adhered the acetate. Before gluing the jar and lid die-cuts, I sponged the bottom of the jar with a bit of blue ink. I added some texture to the background by scoring vertical lines every ¼”. Then I tied the string and added the stamped tag. The strip of dotted paper was added after die-cutting just the bottom of the jar from one edge, then neatly snuggled up to the foam shape. Beneath, I stamped a row of hearts. I nipped off two of the petals just above the hole. This creates the top of the heart. Then from the remaining (leftover) piece, I cut a small triangle from one of the petals. Once fitted together beneath the string, the two pieces create the appearance of a heart. On my next card, I created a bit of a garden scene, stamping two of the stems and leaves from the stamp set in two different shades of green, bending each slightly in different directions.